When you land on the Island, you will be on main street. 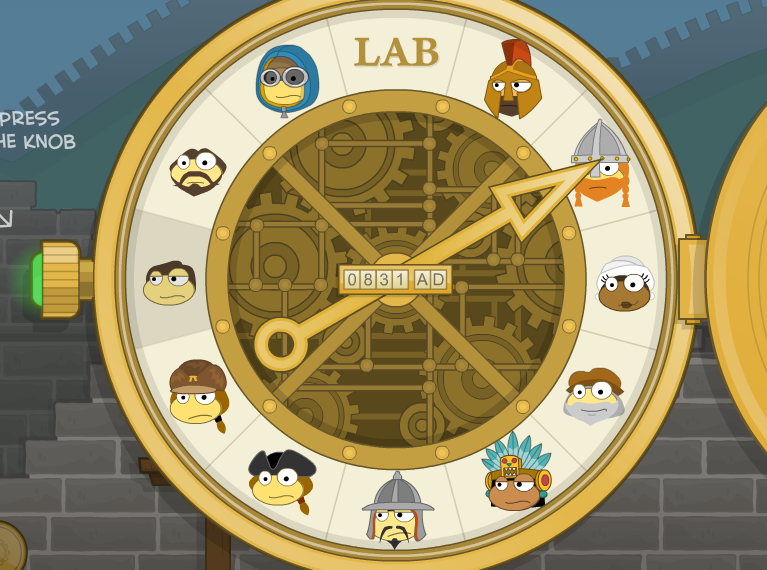 Talk to the Poptropican to the right of you, and they’ll tell you that Pendulum’s Lab has a problem. Keep going right, and there will be a lady with glasses crying in front of the Lab. She’ll ask for your help and go inside. Talk to the lady again, and she will give you a printout. Walk past the lady, and there will be a guy with glasses. Click on him, and he will tell you what the machine behind you is, and how to use it. Begin walking left, sliding down the ramp and onto the next floor. Go right, and push against the thing used to power the Future Machine. The inside of the machine will glow blue. Go back up onto the floor with the scientists on it, and enter the machine. You will appear in what looks like a wasteland. 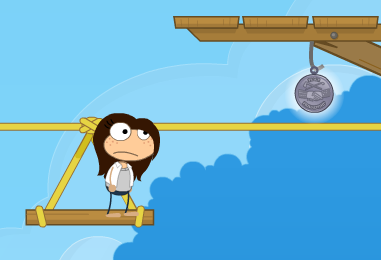 Go left, and there will be a poptropican that resembles you, only much older and much more tired. There is also a sign next to future you, and you may read it by clicking on it, but that is optional because it just repeats what you already know. Click on the time travel device, and click on the face on the very bottom of the device. You will be traveling to China, 1593 AD. 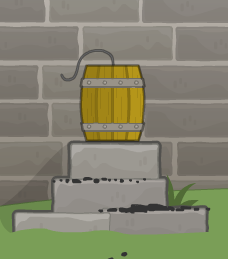 Once you get there, go right until you see a barrel of gunpowder on top of some bricks. Collect it. Jump on top of the bricks the gunpowder was on, and from there jump left and up onto the two platforms above you. Jump onto the Great Wall, and there will be a man sitting on some bricks. Click on him, and he will tell you that you can have his amulet if you beat him in a game. The game is a memory game. There will be eight cards, and he will tell you which one you need to focus on. The cards will then turn over. Watch the card he told you to focus on carefully. After some shuffling, he will ask you which one is the right card. Click on it, and he will give you the amulet. If you fail, don’t worry. You can try again. Hint: It helps to also follow the card with your mouse. Now click on the time travel device, and go to 0831 AD. Once you’re there, click on the first viking. Click the bottom bubble: “I have your amulet!” and you will give him the amulet. Now go right, and jump up the first ledge of the mountain. Keep going until you get to a cave entrance with rocks in the way. Click on the rocks, and the dynamite will blow them up. Enter the cave. Your only means of light will be a torch, which will eventually burn out. Therefore, you have to move quickly. If your torch burns out, you will need to start over. Make your way down to the bottom of the cave, where there will be a small lake. Be careful not to fall into the lake, because if you do your torch will burn out. On the other side of the lake there will be a golden vase; collect it. Exit the cave the same way you came in, or wait for the torch to burn out. Once out of the cave, click on the time travel device. Go to the Roman Empire, 0328 BC. Click on the man with a beard that is guarding the treasury. Tell him you have the vase, and you will give it to him. Keep walking right, until you come to a statue of an animal with the head of a human, body of a lion, wings of an eagle, and tail of a snake. Climb to the top of the statue. From there, jump onto the top of the Treasury (the building you were just standing in front of). At the very top will be a phonograph. Collect it. Click on your time travel device. Travel to Edison’s workshop, 1877 AD (the one right next to the pin). Go left, and enter the house. Once inside, walk left, and go onto the ledge that is in the top left of the building. Click on the man (Edison) and you will give him the phonograph. Exit the house. Go left, and there will be a very large bicycle. Jump onto it, and click the red circle attached to it. The bike will start moving to the right. Once it stops moving, jump into the tree leaves above you. From there, jump onto the branch above you and left onto the house. Go left, and on top of the second chimney will be a colorful piece of jagged stone. Collect it. Click on your time travel device. Click on the Aztec Empire, 1519 AD. Go right. Once you get past the rack of poptropican skulls, be careful. If the Aztec guards see you, they will try to attack you and throw you off. The best way to get around them is to jump onto the steps of the temple they’re guarding. Climb the temple, and there will be a man crying in despair. 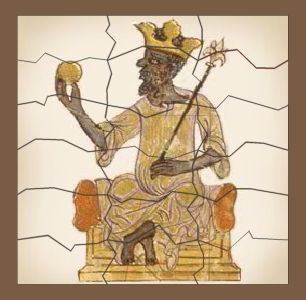 Click on him, click on the third bubble, and you will give him the colorful piece of stone. Go left, off of the temple. Climb to the top of the next temple, and there will be an old warrior carrying a mask. Click on him, and he will give you the mask. Put on the mask, and get off of the temple. Go right. Since you have the mask on, the guards will think you’re one of them and won’t try to attack you. Click on the guard to the right of the temple the Aztec king (the man you gave the piece of stone to) was on. He will give you a pair of goggles. Jump over the area where the snow becomes lumpy. Keep going left, and jump onto the three ledges above you. From there jump onto the part of the mountain to the right and go right. Jump onto the next part and keep going. Go right, and climb the rope into the next area. Once you’re there, go right and click on the man wearing a blue coat. You will give him the goggles. After that, keep going right. Jump onto the three platforms, then climb up the rope and into the next area. 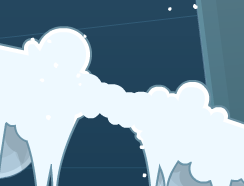 Make your way to the top, but move quickly and watch out for falling icicles. At the top of the mountain will be a Statuette of the Statue of Liberty. Collect it. Click on the time travel device. Travel to France, 1882 AD (this is directly to the left of Mt. Everest). 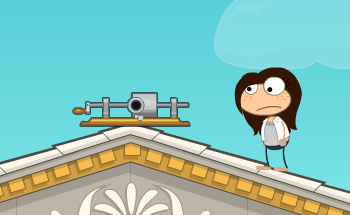 Once you’re there, go left and into the building labelled “Gadget, Gauthier and Cie.” Once inside, go right and talk to the Poptropican that does not look very happy at all. Click on the third bubble, and you will give him the statuette. Exit the building. Go left, and jump on top of the box. From there jump onto the top of the building you were just in, and onto the top of the Statue of Liberty’s head. Jump as high as you can onto the scaffolding, and then jump off, aiming to left. There will be a journal either below you or on the same ledge as you, depending on which ledge you land on. Collect it. Click on the time travel device. Click on Leonardo da Vinci, 1516 AD. Go left until you get to a pile of rocks and a waterfall. Jump up on the rocks, and onto the rocks in the waterfall until you get to the top. Go right, and jump on top of the part of the cliff that’s sticking out. Go right, onto the wood, and jump over the gap. Jump onto the two platforms, and then left onto the highest triangular part of the pulley, dragging it down. Once it stops moving, Jump onto the platform to the upper left and enter Leo’s Workshop. Once inside, jump onto the ledge to the left, and then up the thing that looks like an early design for a helicopter and to the right. Talk to Leonardo da Vinci, and click the third bubble. 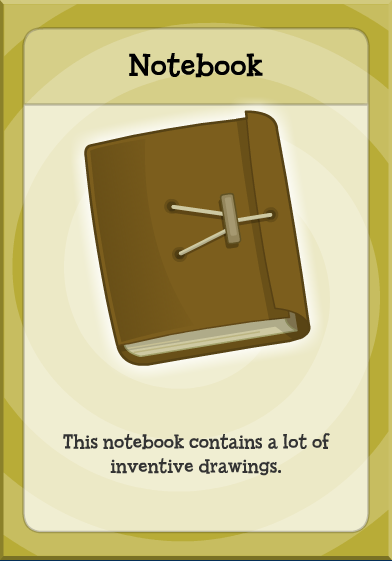 You will give him the notebook, and as a reward you will receive his prototype gliders. Exit the workshop. Go right, and repeat what you did to lower to highest part of the pulley. Get off of the part of the pulley you’re on, and get on the lowest one. There will be a silver medal to your right. Collect it. It may take you a few tries. Click on the time travel device, and go to the Corps of Discovery (Lewis and Clark Expedition), 1805 AD. Talk to Lewis (the one holding a gun) and click on the third bubble. You will give him the peace medal. Go right, and climb the tree. At the very top will be a beaver with a stone bowl on it’s head. It goes in and out of the tree every few seconds, so make sure you time it right and collect the bowl. Click on the time travel device and go back to China, 1593 AD. Once you’re there, go right and jump on the first platform. Then jump onto the next one, and wait a little before jumping to the next one to avoid getting hit by falling bricks. Jump onto the Great Wall, the same place the man with the viking amulet is sitting. This time, don’t talk to him, but jump onto the platform to the upper left. Keep going left on the platform, and jump onto the rope when you see it. Jump off the rope and to the left, and keep going left until you see a man standing a little bit away from the wall. Click on him, and click on the third bubble. You will give him the stone bowl. Click on the time travel device. Go to Timbuktu, 1387 AD. Once you’re there, go right until there is a ramp. Go up the ramp, and jump over the snake. Walk left, past the snake, and jump onto the building to the left of it. Jump onto the tree and onto the next building with a snake to the right. Jump over the snake and keep going straight. Jump onto the two ledges on the tower to the right. Jump over the thin brown stump to your right to be on the other side. Go all the way down until you are on the ground. To the right, there should be a building labelled Timbuktu Inn. Enter the building. After you complete the puzzle, the man will give you the Declaration of Independence. Click on the time travel device. Go to the Graff house, 1776 AD. Move right, and avoid the hedgehogs as much as possible. Keep moving right, and enter the large red house. Once inside, go right and jump up on the ledge to the right. Talk to Thomas Jefferson (the man standing next to the bed with flies), and click the third bubble. You will give him the Declaration. Exit the house. Climb up the windows to get to the top, and on the chimney on the right side will be a bag of salt rocks. Collect it. Click on the time travel devise and go back to Timbuktu, 1387 AD. Once you’re there, go right, past the first building. There will be a small ledge right above you. Jump on the ledge, and then up onto the large building to the left. Jump onto the tree, and onto the building to the right with a snake on it. From there jump onto the higher building to the left with a man dressed in blue on it. Click on him, and click on the third speech bubble. You will give him the salt rocks. Click on the time travel machine, and go to the Lab, 2015 AD. You will appear on Main Street, outside of Pendulum’s Lab. Go back inside. 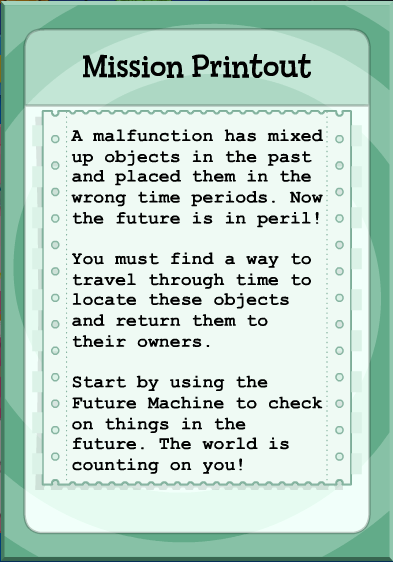 You will need to power up the future machine again and go to the future again to check on it and mack sure everything is okay. Once you’re there, you’ll see that the future has turned out much differently than it had the first time you saw it. Now it is filled with trees and futuristic technology. Go right. Swim across the water, and jump onto the white floor. Keep going right. There will be a bluish tube. Walk into the tube, and it’ll pull you up onto the monorail stop. You may need to wait for a monorail to arrive. Jump onto the top of the monorail, and then onto the monorail above that one. Ride the second one until you get to the grassy patch to the left of the blue and purple building. There will be a hover platform above you. Jump onto it, and it will carry you up until it stops next to another grass patch to the left. Get off of the hover platform and go left on the grass patch until you see another bluish tubular elevator. Go inside the elevator. You are now in future you’s home. Go right, jump over the gap, and keep going right. Future you will be in their bathroom. They will begin speaking to you, and they will give you your medallion.